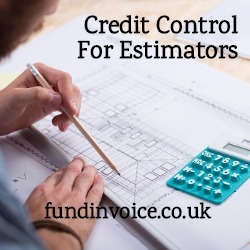 This firm of estimators were originally with a large high street bank, who have an invoice finance arm, but as the bank have withdrawn their debtor protection this client needed to look for a new provider. The facility that they had received from the bank was factoring but the client is both small for that particular provider to handle, and the withdrawal of the debtor protection element of the facility pushed them to look elsewhere. We have put in place a credit control facility for them, at very affordable rates. They now have the option to address the bad debt protection requirement via a third party provider. As this estimating business does not have any need for cash flow finance, they don't need a prepayment facility against their invoices that came as part of the factoring facility. If that should ever change, our funding partner will be able to consider providing this. Credit control outsourcing is an important service to many small businesses, whereby the prime movers of the company would either end up handling the task themselves or would need to employ credit control staff that will bring significant cost and employment related obligations. The alternative is to use a credit control service, which provides a comprehensive approach to collecting in the invoices of the company. This is a good example of the type of deal that is often outside of the scope of some of the larger providers within the industry. However, there are options available, whereby competitively priced facilities can be provided to even the smallest of businesses. Construction finance - funding against invoices and applications for payment in the construction sector. Credit control outsourcing to free up your time.